We will continue to set up Riemann sums to calculate a variety of quantities using definite integrals. In many of these examples, we will partition into n equal subintervals a given interval (or region or ring or solid or the like), approximate the quantity over each small subinterval (and assume it is constant there), then add up all these small quantities. Finally, as n → ∞ we will replace the sum by its equivalent definite integral to calculate the desired quantity. Amount of Leaking Water. Water is draining from a cylindrical pipe of radius 2 inches. At t seconds the water is flowing out with velocity v(t) inches per second. Express the amount of water that has drained from the pipe in the first 3 minutes as a definite integral in terms of v(t). (4π in.2) (v(t) in./sec)(Δt sec) = 4πv(t) Δt in.3. 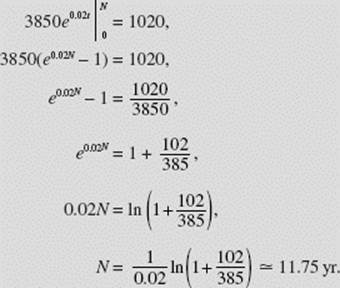 The sum of the n amounts of water that drain from the pipe, as n → ∞, is the units are cubic inches (in.3). Traffic: Total Number of Cars. The density of cars (the number of cars per mile) on 10 miles of the highway approaching Disney World is equal approximately to f (x) = 200[4 − ln (2x + 3)], where x is the distance in miles from the Disney World entrance. Find the total number of cars on this 10-mile stretch. which, using our calculator, is approximately equal to 3118 cars. Resource Depletion. In 2000 the yearly world petroleum consumption was about 77 billion barrels and the yearly exponential rate of increase in use was 2%. How many years after 2000 are the world’s total estimated oil reserves of 1020 billion barrels likely to last? years is therefore This integral must equal 1020 billion barrels. Either more oil (or alternative sources of energy) must be found, or the world consumption must be sharply reduced.